Busy podiatry practices must make efficient use of the office space available in order to manage DME inventory. Select products that offer an opportunity to be used for multiple conditions. Depending on the frequency of need and space allowance, consider products that one can use on the left and right foot, and that require fewer sizes. For less common conditions, establish a protocol for items to be used and the vendor that will provide the products. The goal of maintaining inventory is to have on hand those items that are part of the treatment protocols, in sufficient quantity and sizes, given the physical confines of the available space. The practice should maintain a certain minimum quantity of products on hand, taking into consideration the rate at which they are used and the time for delivery. If the practice consistently runs out of products before the designated reorder time, increase the minimum quantity. The medical assistants and physician should periodically review how well the devices are working, how much patients like them and what they can do to improve application. Consider new products, different products as recommended by others and products presented at conferences. It is essential to designate a person in the practice who is responsible for organizing storage areas and determining maximum and minimum quantities for all products in all sizes. Create a designated frequency and day when the ordering person checks inventory and orders as appropriate. The practice manager should periodically review quantities of products in stock and prices paid. Ordering can be easier via the use of customized screens on the given distributor’s website. Distributors can also help practitioners to order in a timely fashion by sending customized order forms that indicate the quantity of products to keep on hand and the price paid. Tarsal tunnel syndrome. Possible diagnosis codes for this condition are 726.79 for tarsal tunnel syndrome or 719.47 for pain in the joint, ankle or foot. At the initial visit, DME options are the GameDay (Ossur) or Exoform (Ossur), both of which have the possible HCPCS code of L1906. At the follow-up visit, consider a non-pneumatic walker (with a possible HCPCS code of L4386) for severe cases. One can also cast custom orthoses. Increasingly, solo DPMs and small groups of practioners are collaborating with large group practices. Increased size offers greater negotiating power with third-party payers as well as cost efficiencies that come with size. Such an approach also offers greater opportunity to streamline treatments to deliver optimal care in the most cost-effective manner. Ankle sprain (grade 1). Possible diagnosis codes include 729.5 for ankle pain; 719.07 for effusion of the joint, ankle or foot; and 845.02 for sprain and strain of ankle and foot, specifically the calcaneofibular ligament. At the initial visit, one can use an Air Stirrup (Aircast) with a possible HCPCS code of L4350. Other options include a GameDay (Ossur) or Exoform (Ossur), both of which have the possible HCPCS code L1906. Ankle sprain (grade 2). As with grade 1 sprains, possible diagnosis codes include 729.5 for ankle pain; 719.07 for effusion of the joint, ankle or foot; and 845.02 for sprain and strain of ankle and foot, specifically the calcaneofibular ligament. 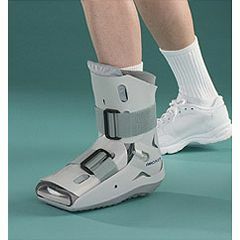 At the initial visit for grade 2 ankle sprains, one may prescribe a pneumatic walker with a possible HCPCS code of L4360. The DME products in this category include the SP Walker (Aircast), the XP Walker (Aircast) and the Air Walker (Ossur). For a follow-up visit, patients may benefit from a semi-rigid shell with compression, such as the AirSport (Aircast), with a possible HCPCS code of L1906. For subsequent visits, patients with grade 2 ankle sprains may use a wobble board or A60 (Aircast), which has a possible HCPCS code of L1902. Other DME products are a GameDay (Ossur) or Exoform (Ossur), which both have the possible HCPCS code of L1906. At the initial visit, patients with grade 3 ankle sprains can use a pneumatic walker, with a possible HCPCS code of L4360 commander cialis pas cher. Durable medical equipment options in this category include the SP Walker (Aircast), the XP Walker (Aircast) and the Equalizer (Ossur). At the follow-up visit, one can prescribe an AFO with multi-ligamentous ankle support with a possible HCPCS code of L1906. One such AFO is the AirSport (Aircast). For subsequent visits, DME options for patients with grade 3 ankle sprains include a wobble board. Other options are the A60 (Aircast), with a possible HCPCS code of L1902, or the Exoform (Ossur), with a possible HCPCS code of L1906.